Specializing in Air Conditioning Service, Tune Ups, Maintenance & Repairs. We never charge for an estimate for any of our home services. Book your appointment for Air Conditioning, Plumbing, Insulation, and Heating Services, now. Every AC service, every new unit installation, every home service project - done right; the first time. Isn't that what you'd expect from Arizona's leading home services team? Find out the difference an Orangutan makes. Mesa residents! 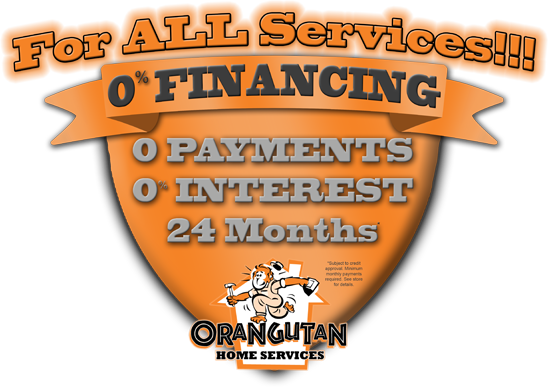 Did you enjoy your home services or heating and air conditioning experience with Orangutan? Tell your friends, family, neighbors and coworkers about it and we'll pay you back. We offer bonuses and special promotions to our local a/c repair customers who speak highly of us. Find out more about our referral program now. We are a total home service company. We specialize in heating and air conditioning in the Mesa area and also provide plumbing, attic solutions (insulation and Aeroseal) and home security. Here's a quick run down of all of HVAC services. Since 1993, Orangutan Home Services has been providing home and business owners with the highest-ranked, most-dependable air conditioning repair and service available in Mesa and its surrounding areas. As the trusted source for a variety of home services, we strive to always provide the most dependable service making our customer care and expertise the unparalleled standard of our industry. Recently we were chosen as the #1 Air Conditioning & Heating Contractor in the United States for the third straight year by The HVAC News; an award given to only one contractor out of the 80,000 – and best of all – we’re right here in your community. With the experience of over 1 Million service calls and over 50,000 new air conditioner installations, our team at Orangutan Home Services is certain to give you the highest quality and most friendly and professional care and service available to any Mesa homeowner.